Will Rising Mortgage Rates Hurt Spring Sales? Mortgage rates are steadily rising, and some housing analysts are already forecasting an impact on the market from the higher borrowing costs. Heading into the spring buying season, the supply of homes remains at record lows, which presses home prices higher throughout the country. But as buyers face higher mortgage rate costs, will that prompt them to pause? As the Federal Reserve prepares to raise its benchmark rate in the coming months, mortgage rates are expected to move higher, too. Mortgage rates are loosely tied to the yield on the U.S. 10-year Treasury. Some homeowners may be less inclined to sell because they don’t want to lose their current record low rates that they secured after the recession. Some buyers, however, may want to move faster before rates rise even more and they face higher prices. Lawrence Yun, chief economist of the National Association of REALTORS®, predicts that mortgage rates will reach 4.5 percent by the second half of the year. Some home shoppers may be in a rush to lock in rates before those edge up even more. Wow! Move in ready brick home. 3 bedroom, office, dining room, remodeled kitchen, oak hardwood floors, cove molding and 2 wood burning fireplaces. Beautifully done with great care given to detail. Privacy fence in backyard Magnificent perennial gardens along with paver brick patio, sidewalks and car turnaround. 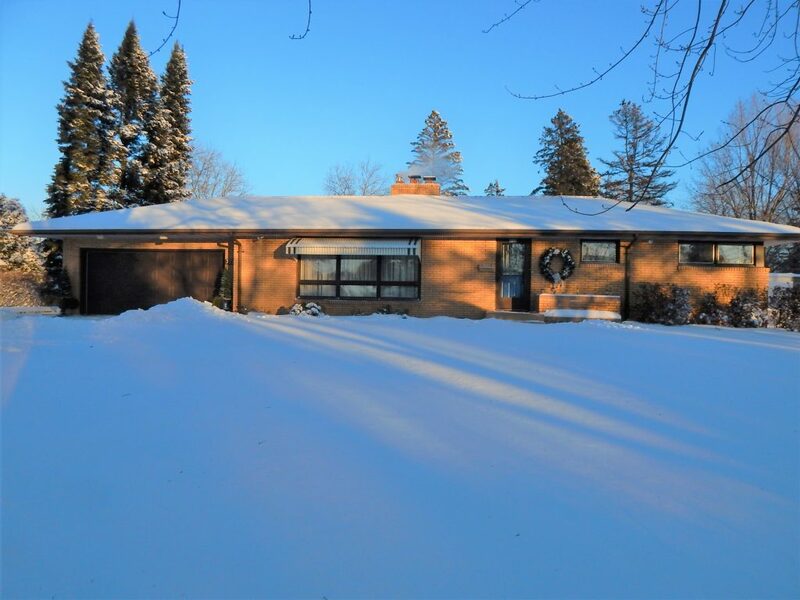 2 stall attached garage with an additional 26×36 garage in the rear which has a 10×26 sheeted and insulated work room with cabinets and counters. Close to Greenhaven, hospital and on snow emergency route. Make it yours now! Mortgage rates were on the rise for the second consecutive week, causing some borrowers to show reluctance. Total mortgage application activity—which reflects both refinancing and home purchase demand—dropped 2.6 percent last week, the Mortgage Bankers Association reported Wednesday. Nevertheless, mortgage volume remains 6.6 percent higher than the same week a year ago. “Rates moved higher last week driven by concerns over a weaker U.S. dollar, signs of more robust growth and rising rates abroad, and moderately strong fourth-quarter domestic growth,” says MBA economist Joel Kan. Broken out, applications to refinance a home loan dropped 3 percent during the week, but are still 3 percent higher than a year ago. 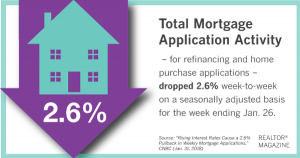 Refinancing applications tend to be more sensitive to rate changes than home buying applications. Applications to buy a home also dropped 3 percent last week, but remain 10 percent higher than a year ago. The MBA reported that the average 30-year fixed-rate mortgage rate was 4.41 percent last week, the highest level since March. The 15-year fixed rate and the FHA rate were at their highest levels since 2011 and 2013, respectively. Contract signings on home sales rose slightly in December, reaching their highest level since last March, the National Association of REALTORS® reported Wednesday. 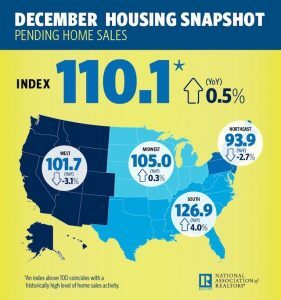 NAR’s Pending Home Sales Index, a forward-looking indicator based on contract signings, moved 0.5 percent higher to a reading of 110.1 last month, 0.5 percent higher than a year ago. The imbalance in supply and demand in housing throughout the country prompted home prices to appreciate 5.8 percent in 2017, which marks the sixth consecutive year of gains at or above 5 percent, NAR reports. Yun does expect price growth to subside in 2018, with some states possibly experiencing a decline due to the changes in the impact of the mortgage interest deduction and state and local deductions under the new tax law. New associate announcement — Matt Rengstorf. Perrella & Associates is pleased to announce its newest associate, Matt Rengstorf. Matt is a Hibbing native, and has spent a large potion of his life on the Iron Range. Whether it be friends, family or business acquaintances, he likes spending time with people, and is well connected within the community. In his free time, he thoroughly enjoys sports – both playing and watching them. 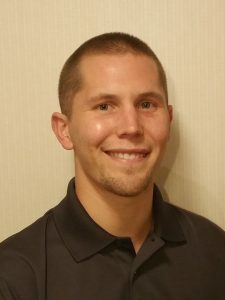 Matt is joining Perrella and Associates as a licensed real estate agent, and is also taking on part of the business and office management within the agency. He is very adept at working with people, and is looking forward to helping clients and customers with all their real estate needs. You may contact him by calling Perrella & Associates at (218) 262-5582 or on his cell phone at (218) 295-2240. Concerns about data security and privacy are deepening as the real estate industry is increasingly being targeted by hackers. As personal and financial information is increasingly transmitted via email and between devices, it’s imperative that real estate professionals protect themselves and their clients from scams or data breaches. This weekend, on Jan. 28, the National Cyber Security Alliance is observing Data Privacy Day by partnering with leaders in industry, government, and nonprofit sectors to educate businesses about the importance of respecting privacy and protecting personal information. As the world becomes increasingly connected and the internet continues to expand, think about the abundance of personal information collected on your devices and what could happen if that information is stolen and used in negative ways. The NCSA has some tips for being more thoughtful concerning information you collect from clients, protecting that data, and fostering trust within your sphere. Secure your logins. Your usernames and passwords are not enough to protect key accounts like email, banking, and social media, according to the NCSA. Always turn on the strongest authentication tools available, such as biometrics, security keys, or a unique one-time code through an app on your mobile device. Keep up with updates. Update your security software, web browser, and operating system to have the best defense against viruses, malware, and other online threats. Be thoughtful with what you share. Consider what you’re posting online and who might see it. Regularly check your privacy and security settings on your social networks. Secure your devices. Every device should be secured by a password or strong authentication—finger swipe, facial recognition, or other technique. These security measures limit access to authorized users only and protect your information if devices are lost or stolen. Think before you app. Information about you, such as the games you like to play, your contacts list, where you shop, and your location, has tremendous value. Be thoughtful about who gets that information and understand how it’s collected through apps. Create a culture that respects data security: Educate agents about their role in privacy, security, and respecting and protecting the personal information of customers. “Every company must be able to demonstrate how it is protecting data privacy to earn the trust of customers, users, partners and employees. This takes a collaborative, risk-based data privacy practice that aligns with industry best practices, customer demands, and regulatory requirements,” said Michelle Dennedy, vice president and chief privacy officer for Cisco, a partner of the NCSA. The NCSA has tips on how to check your various privacy settings, safety tips for mobile devices, and a #CyberAware monthly newsletter for families to share online safety news and resources, which you can share with your clients. Additionally, the Federal Trade Commission has created a webpage that has advice to help small business owners protect not only the networks and systems that are the backbone of their business, but also their customers’ sensitive data. The website also includes videos that show steps small-business owners can take to ensure their businesses have secure networks. Motivated seller! This darling home has so much curb appeal, newer roof and siding. Large deck off the back with a sliding door to access the backyard. One stall garage with plenty of storage. Well maintained and affordable call today! Mortgage rates are moving higher, and that has some home shoppers rushing to locking in rates before they edge up even more. Mortgage applications for refinancings and home purchases increased 4.5 percent last week compared to the previous week on a seasonally adjusted basis, the Mortgage Bankers Association reported Wednesday. Loan applications are now 6.1 percent higher than the same week a year ago. Broken out, applications to purchase a home surged 6 percent during the week and reached their highest level since April 2010, the MBA reports. Loan applications for home purchases are now 7 percent higher than the same week a year ago. “A combination of being left on the sideline last summer due to a lack of inventory for sale and the prospect of slowly rising interest rates over the near term appears to have buyers in a hurry to start the spring buying season,” says Lynn Fisher, the MBA’s vice president of research and economics. 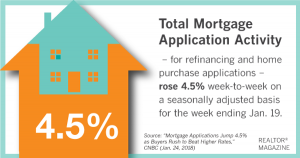 Mortgage applications to refinance a home increased 1 percent for the week. Typically, refinance applications move lower when interest rates rise, but borrowers are showing some concern for missing an opportunity to refinance at lower rates. The 30-year fixed-rate mortgage averaged 4.36 percent during the week, its highest average since March, the MBA reports.